Italian ryegrass is a high quality grass that has become popular as a companion crop for alfalfa seeding. Italian ryegrass is native to southern Europe and includes a range of types from non-winterhardy perennials to annual types. The entire category is often mistakenly called “annual ryegrasses”. The inclination for Italian ryegrass to winterkill, combined with quick establishment and good quality make it a potential fit as a companion crop with alfalfa plantings. Italian ryegrass provides benefits similar to oatlage including weed suppression and erosion control. For dairy producers, Italian ryegrass is more desirable than oatlage because of the potential for high quality, more palatable forage. As a rule of thumb, alfalfa seeded with Italian ryegrass typically has a greater yield than alfalfa seeded alone but a slightly lower yield than alfalfa seeded with oats. For these reasons, Italian ryegrass can be a good companion crop for alfalfa seedings under the right conditions. One should seed non-heading types (those perennial types that require vernalization for heading). See a list of Italian ryegrasses at www.uwex.edu/ces/forage. How well does Italian ryegrass yield as a companion crop? Sulc and Albrecht (1996) seeded early and late maturing varieties of both diploid and tetraploid Italian ryegrass with alfalfa at two locations in Wisconsin (Table 1). The data indicated early maturing varieties yielded more than late maturing varieties of ryegrass. Sulc and Albrecht (1993) also found Italian ryegrass / alfalfa mixtures yielded more than solo alfalfa but less than oats seeded with alfalfa in the seeding year. However, the Italian ryegrass generally yielded more consistently throughout the growing season than oatlage, which yielded little after first cutting. Italian ryegrass varieties have been evaluated in University of Wisconsin yield trails for many years. Seeding year yields with differing ryegrass varieties had a range of 77 to 138% of the total trial mean, which has been between approximately 3 to 5 tons dry matter per acre. In pure Italian ryegrass stands, the yield range across all locations and years has been as low as 1 ton per acre and reached nearly 10 tons per acre in other environments. Grass yield trial results can be downloaded at: www.uwex.edu/ces/forage/resdata/grass_table.htm . Are there differences between Italian ryegrass varieties? Yes. Since Italian ryegrass has been popular throughout Europe and the southern United States for many years, numerous varieties are available. As shown in the study by Albrecht, there are early or late maturity varieties and diploid or tetraploid varieties; however some may be annual ryegrass rather than Italian. Tetraploid ryegrasses usually produce fewer but larger tillers with wider leaves than diploids (Sulc and Albrecht, 1996). A trait of Italian ryegrass that may or may not become apparent after establishment is heading. 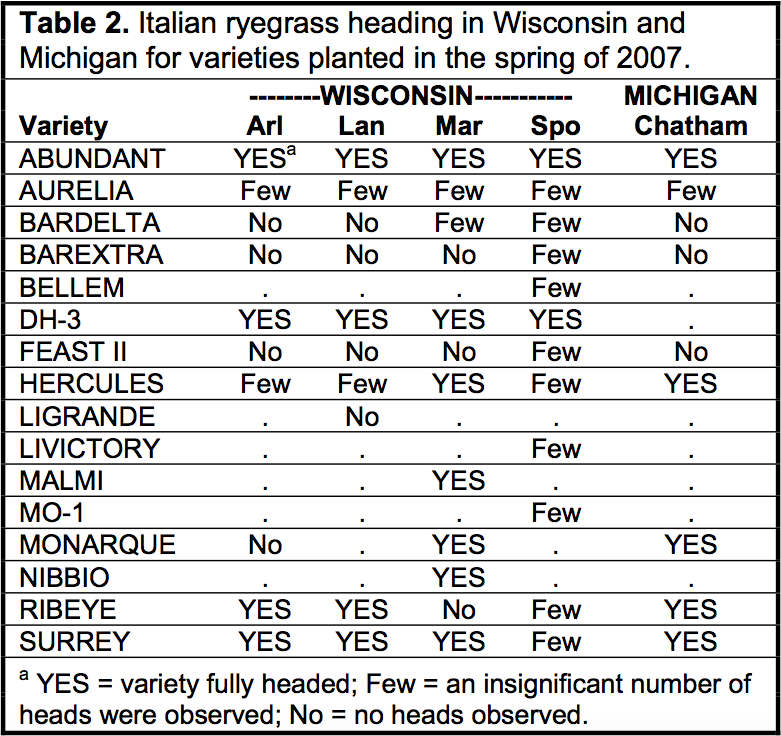 During the summer of 2007, numerous varieties promoted as Italian ryegrass were evaluated in Wisconsin and Michigan to assess heading (Table 2) (Undersander et. al 2007). Once Italian ryegrass heads, quality declines; therefore, non-heading varieties may be preferred. At what rate should Italian ryegrass be planted with alfalfa? Seeding rate is very important for Italian ryegrass / alfalfa mixtures. While all producers would like to harvest a large amount of high quality forage even in the seeding year, an excessive rate can hurt the yield of the established alfalfa in following years. Chart 1 summarizes a study in Clark County, WI. Five, ten, and twenty lbs/acre of Italian ryegrass were no-till planted with Italian ryegrass in 2005. 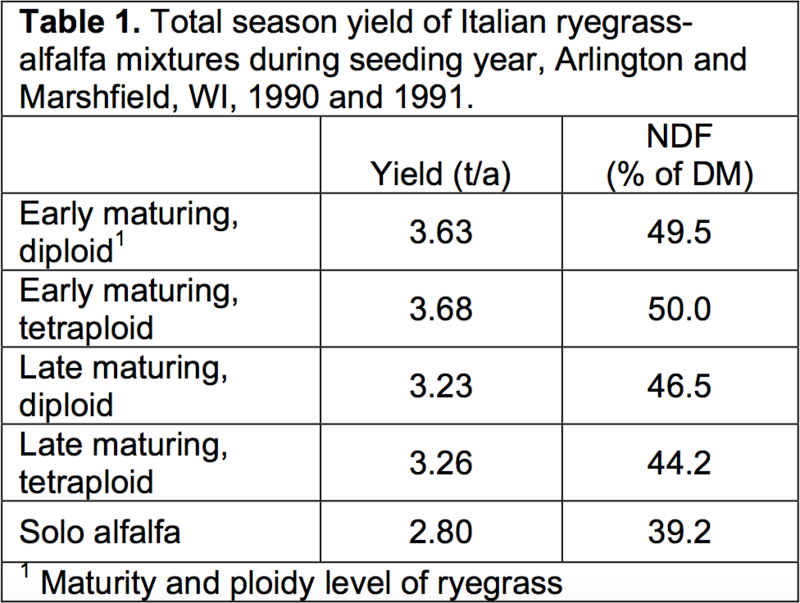 There were no yield differences between seedings with five, ten, and twenty lbs/acre of Italian ryegrass during the establishment year; meanwhile, the alfalfa alone treatment had a yield that was 17% less than the maximum. At the end of the growing season, the number of stems of alfalfa per square foot was counted. Sixty-three, 42, 36, and 30 stems per square foot were counted in the pure alfalfa, five, ten, and twenty pounds per acre of Italian ryegrass, respectively. In the first year of established alfalfa, the yield decreased as the Italian ryegrass planting rate in the previous year increased. The recommended seeding rate for Italian ryegrass with alfalfa is two to four pounds per acre. How does weather influence Italian ryegrass? Italian ryegrass grows most vigorously in cool, wet environments. As observed in the heading study, the tendency to express heading changed by location and variety. This indicates there is an interaction between environment and variety. Sulc and Albrecht (1992) state, “Ryegrass will be less desirable than oats or barley as a cover crop at each moisture extreme. The ryegrass can be too competitive and reduce alfalfa stands in very cool and wet growing conditions, especially on poorly drained soils. They may not provide as good ground cover as oats in dry conditions.” Use of Italian ryegrass is not recommended on droughty (sandy) soils. How does Italian ryegrass quality compare to other forages? Italian ryegrass has an advantage over oats as high quality dairy cattle forage when used as a companion crop. Initial research with Italian ryegrass used NDF and ADF digestibility measurements. Under those measurement techniques, while better than other grasses, Italian ryegrass did not appear as desirable as alfalfa. However, after the introduction of NDF digestibility (NDFd) and Relative Forage Quality (RFQ), high NDFd of Italian ryegrass coupled with good crude protein levels shows Italian ryegrass can make suitable dairy forage when harvested in a timely manner. Chart 2 shows results from a study planted at Lancaster, WI in 2005. 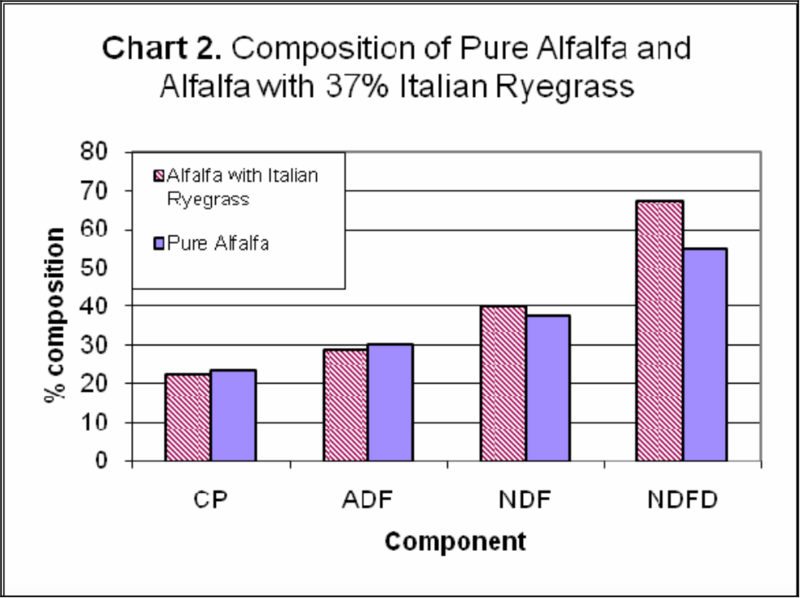 Alfalfa with 37% Italian ryegrass had considerably greater NDFd than pure alfalfa. To achieve both high quality and yield, Italian ryegrass / alfalfa stands are first harvested approximately 60 days after planting. Additionally, while oats is low in palatability, making it difficult to include in dairy rations, Italian ryegrass is much more palatable and can make excellent dairy cow feed. Sulc, R.M. and K.A. Albrecht. 1992. Ryegrass Companion Crops for Alfalfa Establishment. Agronomy Advice. University of Wisconsin-Madison. Sulc, R.M. and K.A. Albrecht. 1993. Ryegrass Companion Crops for Alfalfa Establishment: I. Forage Yield and Alfalfa Suppression. Agron J. 85:67-74. Sulc, R.M. and K.A. Albrecht. 1996. Alfalfa Establishment with Diverse Annual Ryegrass Cultivars. Agron J. 88: 442-447. Undersander, D.J., M.G. Bertram, J.R. Clark, A.E. Crooks, M.C. Rankin, K.G. Silveira, and T.M. Wood. 2007. A1525 Forage Variety Update for Wisconsin. Board of Regents of the University of Wisconsin System.